A few Starbucks regions currently have a promotion for $2.00 off a bistro box, panani, or lunch sandwich. The way it works is that the customer has to buy something in the morning and get a receipt. 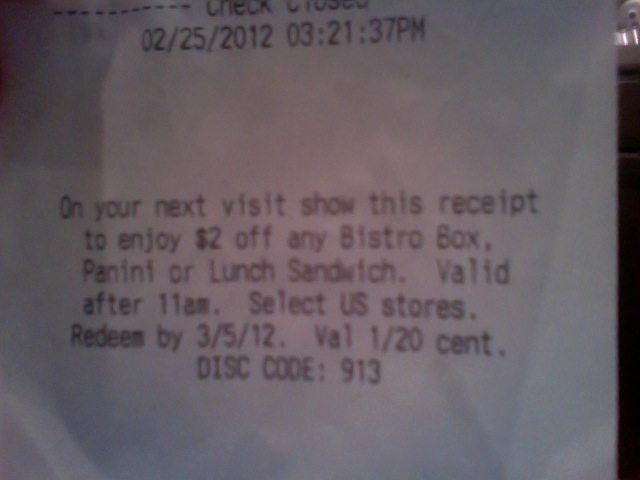 Then the customer returns to Starbucks after 11:00 a.m., with the receipt in hand, and receives $2.00 any bistro box. panini or lunch sandwich. One interesting aspect of this, so I hear, is that the discounted lunch item does not need to be purchased on the same day as the morning purchase. In other words, a customer could go to Starbucks in the morning, hang on to his or her receipt, and return many days later and receive the promotion on the bistro box, and specified lunch items. From what I know, this promotion has been going on mostly in the Southern states, from Texas to Florida. Please tell me if you’ve seen this promo! It definitely does not exist here in Seattle. Actually, I wish it existed here in Seattle! That sounds like a good deal! I think the purpose of this kind of promotion is to develop the kind of customer who comes to Starbucks both morning and afternoon. Since the busiest time of the day is the morning, the afternoon daypart is where Starbucks is frequently looking for new ways to draw customers in the door. The $2.00 off promotion is scheduled to end on March 5, 2012. Have any of my readers been taking advantage of this promo? Thank you to my twitter follower Joshua for emailing me that attached image, and allowing me to post it here. I apologize that this is a very short blog article. I am having some computer problems right now, and that may slow down how often I update this blog. Last but not least, please send in your entries for the chalkboard art contest – anyone can enter and there are lots of prizes! Weekend open thread: A book, a double tall latte in the UK, and Starbucks rewards gets updated. Melody thanks for this post. I asked the SM at my local store about this promo and he knew nothing of it and did not think it would be coming here. I think it would be good to go national. Also, it seems like it is a very short promotion. I do like the idea that you can save the receipt and use it on another day. Hope your computer problems are resolved soon. I too like the idea that the receipt canbe used on a later date, not just the same day. I’m much more likely to visit Starbucks on an afternoon when I haven’t already been there that morning. Too bad we don’t have and lunch food items in my local stores! @purple1 Have u suggested to your sm that he might want to read this blog? He may want to, to be able to keep up with u.:) Ive heard gossip that there is a national bounceback receipt promo coming soon, but it’s beverage bssed. I dont know enough to write a blog post, and i might have it wrng. I hate using my phne to cmment. This lunch promo has been going on for a few weeks already , i think. I hope someone from the south weighs in. Melody I can assure you not only have I told the SM about this blog I have also given him your cards as well as passed them out to some partners. I sometimes think they don’t care or are amused at what I share. When I get a chance to see the SM, I will tell him again about this promotion. Hi Melody (and all) – I haven’t seen this in my area, but I do like the idea of getting customers to return. While I personally favor being able to return on a later date, getting them to return same-day may be the better way to go. This reminds me of the summer $2 cold beverage offer – which continues to be a success. Perhaps something like this could take off as well (of course, the afternoon offer has to be appealing and I’m not sure Starbucks has quite yet nailed it on the lunch menu thing). Later on, I really stopped doing that so much. I learned the lesson that there really are some partners who are not at all interested in a customer perspective of Starbucks. I’m not even saying that that’s many partners, and it maybe a small number, but some partners really do think there is no way that a customer could be informed about Starbucks. The moment a partner snarkily said to me, “Melody, why would I read your blog? I work here” I learned that lesson. While at the time I had a moment of feeling slapped, I am thankful for the wakeup call and learning that lesson! And imho, there’s a thin line between customer and partner anyways. And of course, many people (customers and partners!) just don’t have the time for one more blog – I mean that totally makes sense. I know that feeling too. And I’ve had a few partners say to me, ‘when I get home, I just don’t want to think about anything related to Starbucks’ – And I TOTALLY understand that too. I try very hard not to take my own work home, and I need that break! It is what it is. I put my little cards up on community boards, and I hope those who are interested will take note of the website. I’m sorry your SM isn’t interested in this site, but who knows what’s going on in his head. It could be any number of things. I feel a little saddened by the partners who think that they only way they ever get good info is from their co-baristas (as if they’re never mistaken) but thankfully, I think the overwhelming majority of partners do not think like that. I think giving a customer an incentive to come back for a promotion at another time besides the same day is really nice and I know of some SB customers that do not have the option to go too far from their offices for lunch and would take advantage of the convenience of getting something from SB for lunch. This kind of promotion would bring them back late morning/afternoon. The availability of lunch spots around here can be hit or miss. Melody also thanks for the comments off topic to this post. Can I offer a possible open topic at a future time – I know it is off topic sorry. But how about something like SB want do you want from your customers and Customers what do you want from SB? I know you have touched on this before. Melody, there are all kinds of people in the world who are able to ‘turn off’ work when they go home. I am not one of them, but I know they do exsist in the world. I imagine some of the partners who didn’t show as much interest as you thought they might may fall into that category. Sounds like the promotion is aimed at growing lunch sales in targeted regions. I don’t know why lunch would sell better in one region vs another, though obviously individual store location would play some part in that. We sell quite a lot of lunch at my store, but there aren’t a ton of other options around. My previous store had a couple of thai restaurants, a dairy queen, a mcdonalds and a subway all within walking distance, so we didn’t sell quite as much there. I think this is a great idea! Great way to introduce new customers to our lunch items and entice customers to come back in the afternoon/evening. I am curious- when there are regional promotions going on what input do the regional directors and regional vp have with corporate SB in pushing for these promotions in their region? @ everyone – Lots of good points – Maybe people in the South don’t think of Starbucks as a lunch spot, so the bistro boxes need this extra push from these receipts. The person who sent me this receipt is in Florida (I think), and it’s interesting that it may be a little different there than in Texas. @Purple1 – I suspect that these promotions are all born out of the SSC, and not really the bailiwick of regional directors. It makes no difference if you are a barista, a mechanic on the line at Boeing or a Banker, not knowing and understanding your customer is a detriment to you, your job, and the company you work for. There are no exceptions here, it is an all or nothing commitment. The real Partners (capital P on purpose) don’t just put in their shift; they study their customers, their company, and their industry. If a person is not happy in their job it is in a large part to the points in my previous sentence. Without that an employee can have all the pay and benefits in the world and they will not be truly happy and their customers will not be served. Melody, your customer perspective is what makes your Blog great (a work in progress but aren’t we all). That is why you attract the Partners, with a capital P, and the others (small p) spend their time blathering elsewhere about how bad they have it. Now to get back on topic: I hope that Starbucks gets a good response to this sort of promotion. It is one I would go for. I think it is unfortunate that there are regional promotions which leave so many people out. I understand the value to do them that way, however, how is SB so sure that these regions and not other regions will not benefit from this promotion? To me this kind of promotion would be a success on a national level. Dad Cooks re your most recent comment- yes totally agree. Denise R here too I do not think the bistro boxes are big sellers, however, the other lunch sandwiches I thought were included (look at the receipt). I suppose you are correct that everything in some ways has an impact on purchases. Gas here has not yet gone over $4/gal but I am sure soon it will. I would argue that we sell more bistro boxes then lunch sandwiches in my area. We also sell an enormous amount of paninis(8+ daily). I could see this being a hit nationwide, but can understand if Starbucks doesn’t want to offer the whole country two dollars off. It looks like the bistro. boxes totally sell out here. (except the one w/ lettuce, peanut butter sauce, and the meat in its own container looks like it doesn’t move) I think I understand the need to do regional offers in places hit super hard by the great recession. Those are likely places where folks aren’t going to want to spend around $5 to try a smalish bistro box when a burger, cola, and fries might be the same price? We have the bistro box promotion here in New Braunfels, TX, at my store but I am not interested in lunch offerings at Starbucks usually. I will get the breakfast sandwiches occasionally and the pastries and I did use my postcard for the $1 petite treat today. Starbucks will never be a “lunch” place for me as I can get a cheaper sandwich or burger elsewhere. I am there for the cappuccinos and the black tea lemonades and whole bean coffees. A prepackaged lunch will never draw me in the door. @Diele – I can easily agree! That is a meal of champions. I like those marshmallow bars too. Not sure though that I’d have the chips with that meal. They’re good, but I think I’d be full. And those chips always seems like they need something to dunk them in. I love the sweet potato chips plain or with salsa. I generally eat half the marshmellow bar and chips, then eat the rest on my 10 minute break. $2 off is practically a free coffee! Who could say no to that! I agreed with Rich. Thank You!